Need a change.. tired of being stuck indoors... Time for some sprucing up!! 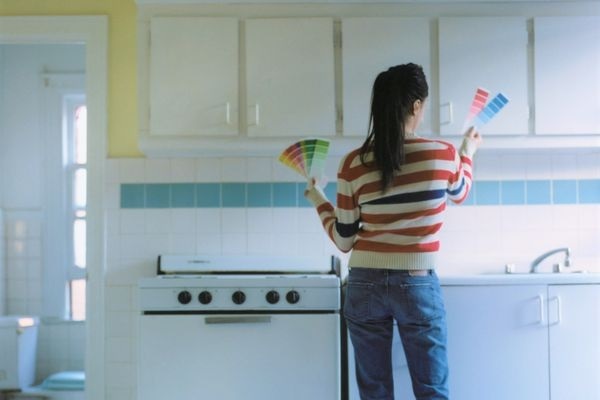 To estimate how much paint you’ll need, multiply the perimeter of the room by the height of the walls, which will give you the square footage of your room. For ceilings, simply multiply the length by the width. A gallon of paint typically covers 350-450 square feet. It’s time to start painting. Remember: start at the top and work your way down – ceiling, walls, trim. Paint the ceiling’s width instead of its length to ensure a wet edge to work with. Paint until it's completed. Next you’ll do a process called cutting in. With a trim brush, begin by painting a three-inch wide strip along the top of each wall where it meets the ceiling. Do one section at a time, and then use your roller to paint that wall’s surface. You’ll use this technique also around doors, corners, baseboards and windows before painting the walls. After ceilings and walls, it’s time to paint the trim. After protecting floors and walls with tape (use tape on newly painted walls only after 24-48 hours), you’ll start with the edge closest to the wall. Using a 2- or 3-inch brush, apply the paint, being careful not to glob on too much. Remember to paint top to bottom, doing the baseboards last. For water-based paints, use plain soapy water to wash your brushes and rollers. For oil-based paints, you’ll need to use paint thinner and soap and water.